It was purely coincidental that during #MappingMonth a Tableau Public author reached out to me and asked me if it was possible to create a map with rivers as interactive polylines. He was in the process of gathering coordinates manually from Google Maps, and he felt there had to be a better way. 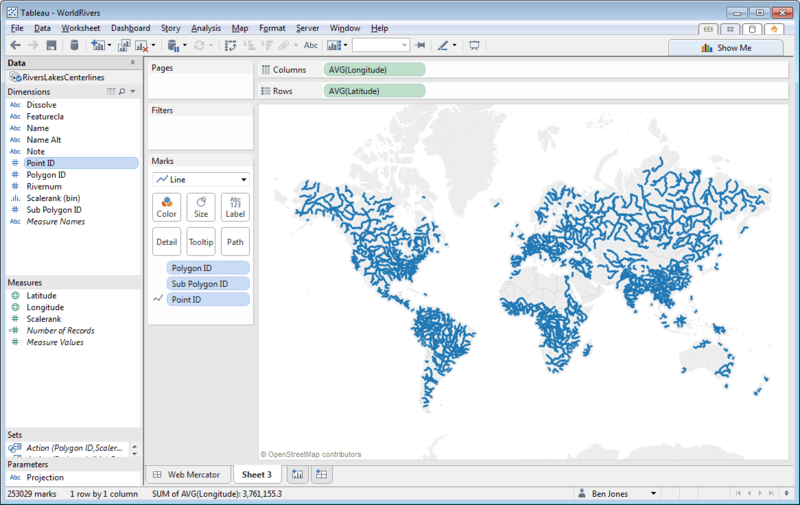 I knew he was right – if we could find a data set with latitude and longitude coordinates for each river, then we could use the Path shelf to draw each river as a line on a world map. What, exactly, is the use-case for a map of the world’s rivers? I admit I don’t quite know, but it was an interesting challenge, and certainly made for a fun and educational project for my two sons to help me with. You gotta get creative to make sure they learn something during the summer. To start with, I had to find the Shapefiles for all of the world’s rivers. At least the big ones. As I mentioned, Allan Walker pointed me in the direction of NaturalEarthData.com’s 1:10m Physical Vectors, and uber map geek Nathaniel Kelso helped me find the files to download (he also runs a github account with links to download every NaturalEarthData download file). This resource is truly amazing – it has shapefiles for coastline, oceans, reefs, glaciated areas, and a few more – all freely available. I downloaded a zip file of rivers and lakes centerlines. Step 1 complete. To complete the viz, I colored the rivers by Scalerank, added two Quick Filters (Scalerank and river Name), formatted the Tooltips, and added the map along with a histogram of Scalerank to a dashboard. I asked my son Aaron to pick the title font, and he picked Brush Script MT because he said he thought the letters looked “rivery”. I couldn’t argue with that, so we made a PNG with transparency and added it as an image (because Brush Script MT isn’t a safe web font). Notice that Greenland doesn’t loom as large as it does in the Mercator projection, which distorts it’s size quite a lot (it’s actually 1/8 the surface area of South America). Also notice, however, that the Robinson projection “curves” inward at both poles (latitude lines get shorter as you move away from the equator) – this means that if you were to zoom in to the street level in, say, Finland, streets that cross at a right angle in the real world wouldn’t appear to on the map. That’s what you get with Mercator in return for some area distortion. Every map has its pros and cons. If you’re interested in building a Robinson projection yourself, here are the equations to make the conversion within Tableau. I recommend either drawing the coastlines and graticules yourself, or finding a good Robinson map image and adding it as a Background Image, fixing the position carefully. Here is the map image I used. It works fairly well when zoomed out to show the entire world, but I hid the Zoom controls since it really doesn’t work well when zoomed in. Well that is really rather splendid. Odd that the Mississippi is not a Rank 1 river, but the Missouri is. I noticed that, too, Joel. It looks like the Lower Mississippi (and the Missouri) are Scale Rank 1, but the Upper Mississippi is Scale Rank 5. Not sure why that is the case. Very cool. Though if I put one of these rivers into Google Maps, the resolution is quite bad. Tracing for example the Eel River in California, it runs across mountain tops. Is there a data set with better resolution that actually traces the rivers in Google Maps? This is a brilliant article and helped me with a similar project I am working. Do you know if it is possible to get the coordinate data for other water routes? For example, I need to show canals in Amsterdam taken. Hey Trevor! Thanks for the comment. I found waterway shapefiles for the Netherlands here (not sure how legit “mapcruzin.com” is though) and created this viz that lets you search by waterway type. You can also zoom in on a city by typing in the city name using the Map Search feature in the top left corner of the map. Hope this helps! Thank you so much for this tutorial. I followed it to convert a shapefile to TDE for ‘mapping the roads of the world’ viz. I am still learning, and your tutorials have been very helpful.